The "Better Journeys" series explores how our daily commutes can be made better, with a focus on ride-hailing. In this third instalment, we move away from the roads to the family life of two private-hire drivers, seen through the eyes of their sons. Standing at more than 1.8m tall, Mr Wymann Tang dwarfs his father — Mr Tang Jui Hai comes up only to his son’s chin. But the younger Mr Tang knows that he is where he is today because he stands on the shoulders of a giant. 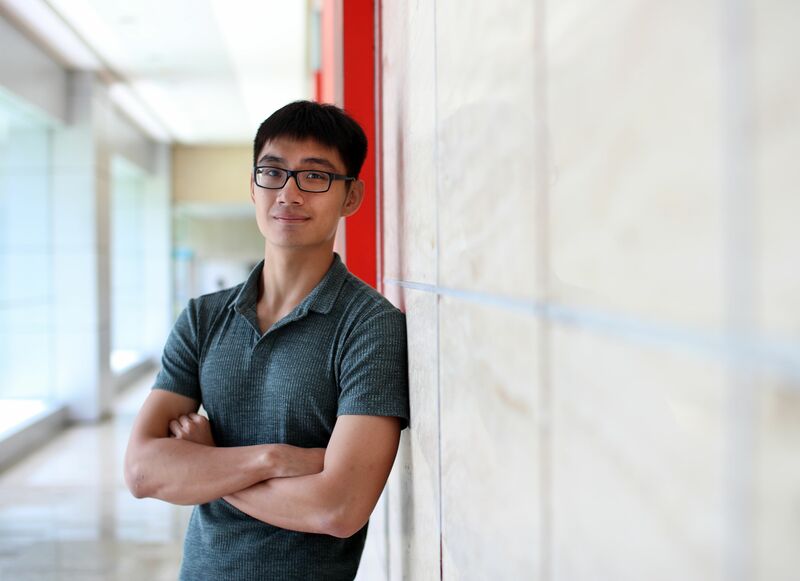 The 22-year-old is a freshman at National University of Singapore’s Yong Loo Lin School of Medicine, a course of study popular among his Raffles Junior College peers. Meanwhile, Mr Tang Jui Hai’s formal educational stopped at primary school — something common for his generation. The 60-year-old used to own a liquid petroleum gas distribution company but his gas prices could not keep up with the subsidised prices offered by the unions. The rising popularity of electric stoves also hit his sales hard, forcing him to shutter the business. Undeterred, he obtained a Vocational Licence and drove a taxi to put rice on the table, and his children through school. His wife contributed what she could as a part-time cashier at a supermarket. To most, it would be unthinkable to go from owning a business to driving a taxi, but the career switch was something that had to be done. Now a full-time driver for Grab, the older Mr Tang starts driving by 7.30am on weekdays, and comes off shift only in the evening — sometimes later, if business is good. His major respite comes on Saturday morning, when there are fewer passengers, so he can afford to leave the house a few hours later than usual. Mr Wymann Tang is aware of the health hazards posed by long periods of continuous driving. He knows his father takes regular breaks — the Grab app ensures this by sending alerts and his mother sends gentle reminders via text messages — but it doesn’t stop the medical student from worrying about his father’s well-being. Hence, he encourages his father to exercise regularly; they jog together when they have the time. Unfortunately, this time can often be scarce. Mr Wymann Tang lives on campus and goes home only on weekends. Even then, there’s no guarantee of seeing his father, who leaves the family home before Mr Wymann Tang wakes up, and sometimes returns only after his son has gone to bed. Sometimes, father and son go without seeing each other for weeks, which makes the time they spend together all the more valuable. When they can, the Tangs sit down for family meals, a relative luxury compared to the quick afternoon bites that Mr Tang Jui Hai grabs when on shift. It may be tough to see his father working hard on his behalf, but it also makes Mr Wymann Tang all the more determined to make the most of his father’s sacrifices. In fact, it is because of his father that his heart was set on becoming a doctor. After his internships at the voluntary welfare organisation Special Olympics Singapore and the Assisi Hospice, Mr Wymann Tang realised he wanted to empower others — just as his father had empowered him to pursue his passions. This is why Mr Wymann Tang is grateful for the insurance that Grab provides for his father, as well as for the $10,000 afforded to him by the Grab Scholarship, so his father can afford to scale back on his working hours. Laughter is the glue that binds the Ngs. Mr Ng Kah Hui and his father Ng Ban Hoe crack jokes with abandon, laughing and clapping each other on the shoulder. “Humour is really what my father is best known for,” says the 24-year-old. And it is also that sense of humour that helped carry the Ngs through turbulent times, such as when Mr Ng Ban Hoe left his job in construction to become a full-time taxi driver 12 years ago. And he was unfazed despite making the leap after 19 years in construction. “I like to drive. It was a win-win situation for me,” says the 53-year-old who is now a private-hire driver. Mr Ng Kah Hui reveals that the Grab Scholarship came as a huge relief for him and his dad — and a stroke of luck to be one of the chosen 10 out of over 150 applicants. “I used to worry about how I would finance my university education, so the scholarship eased my concerns,” says the future student of Nanyang Technological University’s Computer Science Programme. His two brothers — a 19-year-old polytechnic student and 22-year-old national serviceman — can only make limited contributions to the household, while his mum helps out with her income as an accounting assistant. “Thanks to the scholarship, my parents’ income can go towards supporting the family,” says Mr Ng Kah Hui, whose freshman year will begin in August. He describes his close-knit family as “a traditional, conservative Chinese family — we don’t express our love with words”. He often sees his mother sitting in the living room, waiting for his dad to return from his shift — even when the key turns in the lock at 4am, which it often does. He sees how she prepares his father’s favourite soups and steamed fish, ensuring that he doesn’t go to work on an empty stomach. Similarly, he considers his parents’ willingness to let him pursue his own passions as a form of love. “My parents have never tried to dictate the way my brothers or I live,” says Mr Ng Kah Hui. Less than 9 per cent of the world’s population live in South-east Asia, but according to the World Health Organisation’s Road Safety in the South-east Asia Region 2015 report, the region contributes 25 per cent of worldwide road traffic fatalities. With ride-hailing drivers spending extended hours on the road daily, Grab launched a Safer Everyday Tech Roadmap last year to encourage safe driving behaviours. Here are five examples of how technology is helping drivers. A safe trip means less harsh braking, acceleration or speeding. Drivers receive a weekly telematics report on their driving patterns — based on data derived from the Grab driver app — to provide quantifiable feedback. The results have been promising. Although the distance covered by Grab drivers in Singapore increased by 74 per cent in July last year compared to the previous 12 months, speeding incidents fell by 48 per cent and heavy acceleration incidents, 16 per cent. Grab drivers receive notification reminders to rest when the app detects that they are potentially tired. This fatigue score is calculated based on metrics such as the driver’s age, telematics data, time of day, how many hours they have been driving, and how many jobs they have accepted. The algorithm is constantly being improved through artificial intelligence and machine learning. By the end of the month, drivers will be able to share their live GPS location with their loved ones — useful if they are driving to more remote areas. If drivers encounter trouble, hitting the SOS button on the app will call up Grab Security or its emergency contacts. Forgetting to key in the Electronic Road Pricing charges sometimes eats into a driver’s income. Currently in beta, this feature automates the input of ERP fares so that drivers can just focus on driving.